After taking about 2 weeks off of my P90X routine I decided to resume it today. According to the calendar schedule I have, I’m now in week 4 (recovery time) and today’s routine was Core Synergistics. It was pretty fun, and not a terrible one to get back into it with. I figured rather than restart at the beginning, just try to pick it back up and keep on going with it. Taxes and some large projects got in the way, but now that those are done it’s time to get back into it. Will try to keep doing it this time. Also am thinking of trying to do them in the morning instead of evening going forward. Still working on getting “caught up”. Today’s official workout was supposed to be Yoga X, but I did Arms & Shoulders + Ab Ripper X instead (yesterday’s workout). Might get caught up tomorrow? Only did about 1/2 the reps for Ab Ripper X, resting in between. 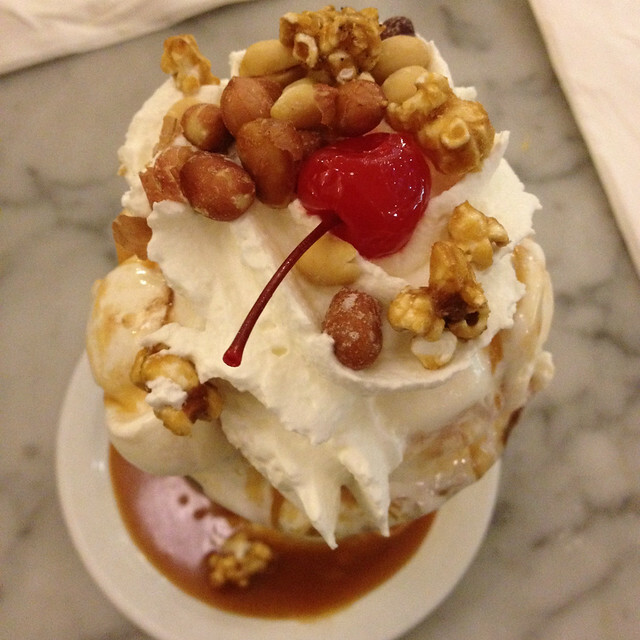 All in all feels good to be doing my best to get one of these in each day. I’m sailing around the Farallon Islands in a race on Saturday, so I’ll be skipping Stretch day for that, another one that I should be able to make up. Did Plyometrics (“jump training”) all the way through today, taking lots of breaks. It is very intense. May still do Shoulders and Arms later tonight to get fully caught up. Ended up doing Chest & Back Monday night (instead of Sunday). 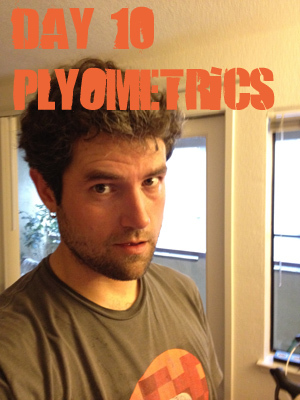 I may try to do the Plyometrics workout (was supposed to be today’s video) tomorrow morning-ish to catch back up. Tomorrow is also Shoulders & Arms. Felt good to get back to it. 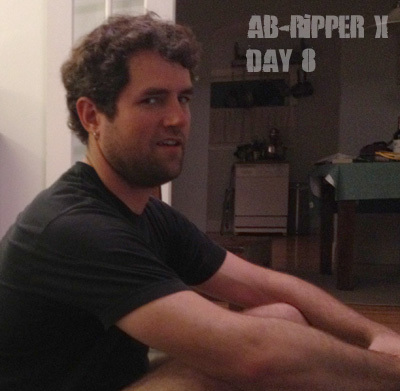 Picture is of me taking a short break while doing Ab Ripper X — so fun! Everyone should do it. 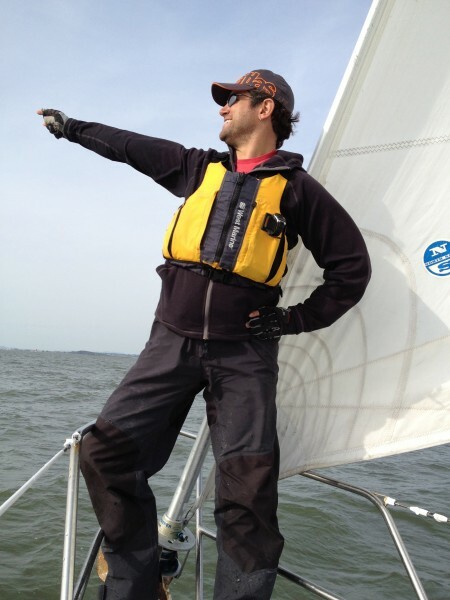 Went sailing today with Craig, Anna Lisa, Julian, Andrea, Julian’s sister, and Amanda. Was an absolutely gorgeous day out on the Bay. We took a Catalina 32 out and enjoyed sunshine, consistent breeze and almost flat water conditions. Went for Cheese Board pizza afterwards — delicious as always. Again with the whole “eat what I want to eat but try to add some additional physical exercise to my regimen and see what kind of results we can get” approach. Mmmm Cheese Board. P90X fitness workout for today is Stretching. Trying to get it completed before midnight. Yesterday (day 5) ended up being a bye day for me for P90X. I had quite a lot of work that I had to finish (a client’s e-commerce shopping cart system wasn’t liking some of the logic that I had implemented, and I needed to fix it before I really did anything else). In bed around 1:45am, I thought I might catch up today (Friday). That didn’t happen though, due again to a number of factors (work, driving down to San Jose, dog-sitting). Today, Day 6 (Kempo) I did manage to get 1/2 of the workout in. It was pretty fun (lots of punching the air) and when it started to get to the bigger kicks I decided to call it a night. Resolving to continue to do my best to show up each day and hit play on this program. Almost done with Week 1. Overall body is still feeling sore, but happy to be doing the program. Did about 40 minutes (out of 1.5hrs) of the yoga video last night, then it was midnight, and I had had enough. The P90X Yoga video definitely focuses on yoga as an athletic exercise (vs. a focus on yoga as a quiet and contemplative practice). It was a nice break and the stretching felt good, as many muscles are feeling sore that haven’t been worked in a while. Overall still enjoying the routine, gonna keep at it. 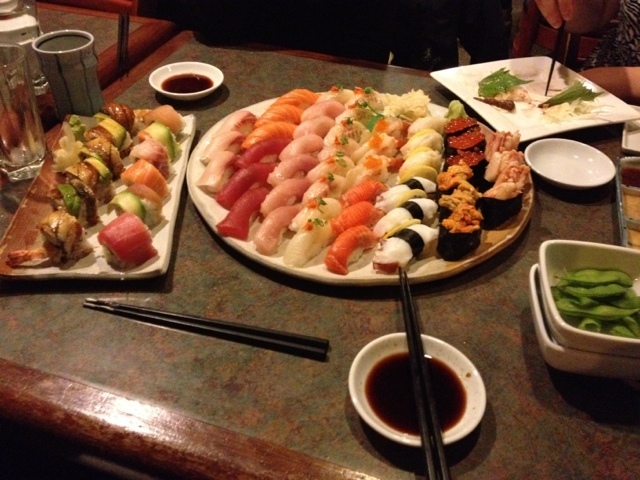 Ate large quantity of sushi omakase style at Kirala in Berkeley. Did not do Plyometrics tonight. Slept instead. Did first 1/2 half of Plyometrics video then had lunch with sister and my awesome nieces in the park. Was pretty wiped out and ready for the break. Went to A’s vs Giants game, enjoyed hot dog & nachos for dinner. Gonna do my best to get through video #3 tonight. I decided that it was time to give the P90X videos a shot, after my brother Andy has done it like 4 times now, with some excellent results. 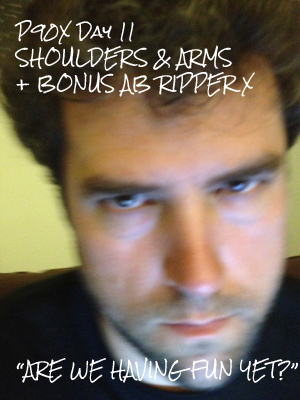 Did the first video this evening (Chest & Back), with the bonus Ab Ripper X. Overall I enjoyed it, and afterwards felt the same kind of wiped-out tired feeling like I used to get when I had my personal trainer. It felt fun, even when I couldn’t really do anymore reps. Also I did air pullups since I don’t have a pullup bar yet, but it still was a good workout! 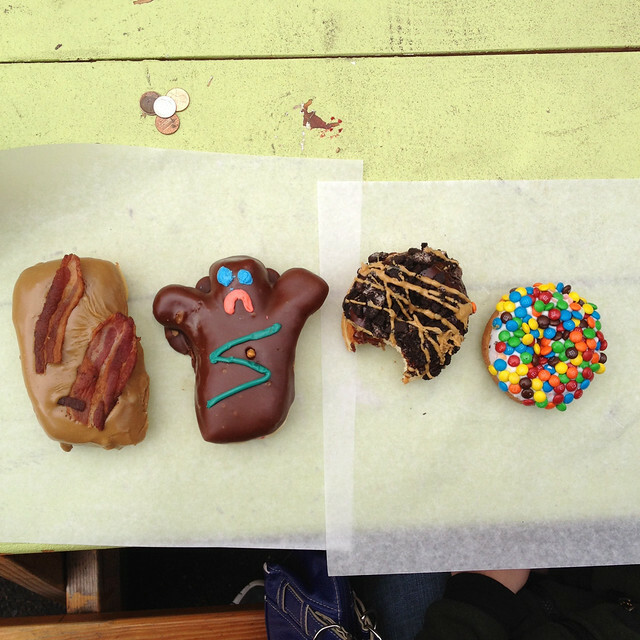 Need to do my fitness test and also take my “before” pics.